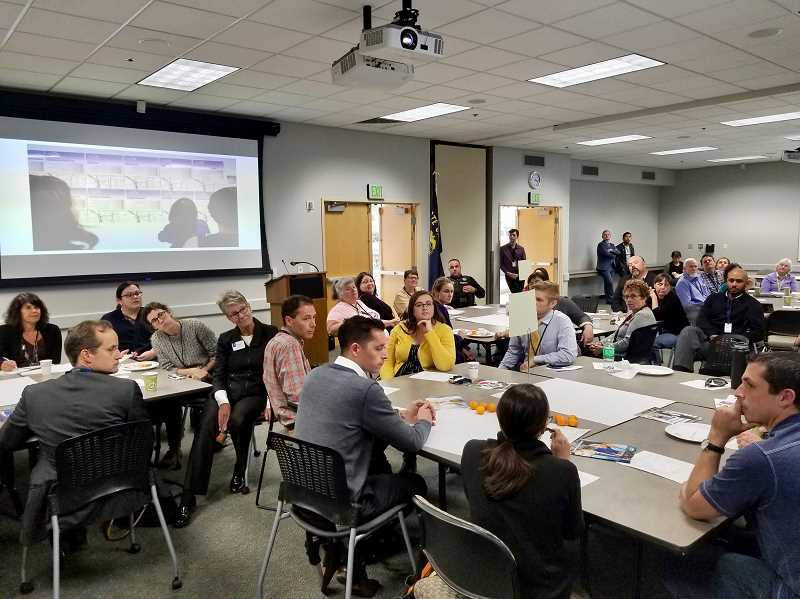 East Multnomah County leaders and concerned residents came together Thursday afternoon, Oct. 4, in Gresham for a housing forum for folks to chat on shared topics, brainstorm ideas and network. The event was part of the East County Caring Community's monthly meetings, hosted by Multnomah County Commissioner Lori Stegmann, who spent the last month touring shelters across the county. "It's critical to have a deep understanding of our system," Stegmann said. "We have a long way to go." Topics discussed during the event included the homeless services system, regional policy options, housing trends and growth, community development corporations and community partnerships. Throughout the afternoon, the more than 65 attendees — consisting of advocates, nonprofit leaders, elected officials, business leaders and Gresham renters and homeowners — rotated through topics, with experts stationed at each table to facilitate the conversations. Lorelei Juntunen, a partner with ECONorthwest, gave a presentation before the small discussions detailing the state of housing in the region. She said there is a lack of affordable housing options throughout Oregon, and in Multnomah County the growth of the population is outpacing the units being built. Juntunen noted that, from 2010 to 2016, only about half of the units needed were constructed. And the vast majority of the construction is happening on the west side. "In general we aren't seeing a lot of affordable housing in East County," she said. In Gresham the average multi-family rent is $1,007 a month, but $823 when isolated to the Rockwood neighborhood. Last year, rents went up for those in the lowest brackets of income, while it was reduced for those in upper levels. "There is a crisis going on, and solutions have to be found," Juntunen said. "Its important to have all types of units being constructed. There needs to be a mix of development to allow housing choices for everyone." Some of the answers could be finding additional revenue to support housing at the lower end of the spectrum, partnering with groups that have the tools to support construction, tenant rights and education, incentives from local governments and regulatory responses. A lot of topics were discussed during the small group sessions. Some groups reflected on the role community development corporations can have, while others looked at what is forcing people out of stable conditions like screening criteria, criminal and credit history and high security deposits. They focused on the need to support organizations and shelters, and flagging neighborhoods that are able to accept new development without being overwhelmed. "Thank you all so much for being here," Stegmann said. "It will take each and every one of us to find solutions here today." The East County Caring Community is a monthly forum to bring together individuals and organizations committed to serving the needs of East Multnomah County residents. Open to the public, the ECCC meets on the first Thursday of the month at Gresham City Hall. For more information, visit https://multco.us/east-county-caring-community.